We are pleased that you are taking time to consider your legacy - and the legacy of our Catholic faith. Each of us has been blessed by God and entrusted with many gifts from Him. We are all called to receive God’s gifts gratefully, to cherish and tend these gifts, to share them in justice and love with others and to return them with increase to the Lord. Part of our responsibility as stewards of God’s gifts includes what is sometimes referred to as our “final act of stewardship” – the creation of our estate plan. Our estate plan is part of our legacy, enabling us to use those gifts that have been given to us to provide for our loved ones in the future. We also have the opportunity to give witness to the importance of our faith and express our gratitude to God by making a gift to the Church that strengthens our parish for future generations. Our parish is pleased to offer you resources to help you in the planning process. Whether you are just beginning to plan for your family or you are considering a future gift to our parish from your will, or as a beneficiary of a retirement account or life insurance policy, we hope you will find the “How to Create or Update Your Will,” “Legacy Giving Options” and “Gifts from Your Will or Trust” brochures helpful. The Catholic Community Foundation of the Diocese of Cleveland is also a resource for you in the planning process. 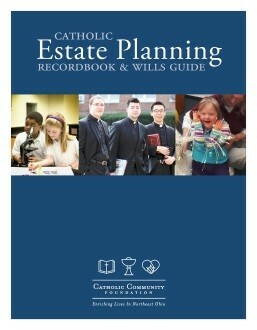 Please contact Mary Lou Ozimek at 216-696-6525 x4070 or via email at mozimek@catholiccommunity.org to request a free printed copy of the Catholic Estate Planning Recordbook or to request a confidential conversation about ways you can remember our parish in your estate plan. The foundation can also help our parishioners who want to establish Donor Advised Funds, Charitable Gift Annuities and Permanent Named Funds that benefit our parish or other ministries of the Diocese of Cleveland. In gratitude for all God has given to me, I give (specify dollar amount, percentage of estate, or description of asset) to Saint Gabriel Parish, 9925 Johnnycake Ridge Road, Concord Township, Ohio, 44060. Tax ID# 34-1003014. Please consider letting the parish know of your plans. We would be grateful for the opportunity to thank you! Click here for a Legacy Gift Intent form that can be completed and sent to Fr. Fred Pausche in the parish office. For more information, please contact Fr. Fred Pausche at the parish office or our parish liaison at the Catholic Community Foundation, Mary Lou Ozimek. Click on the images below for informational brochures and a most helpful Estate Planning Guide.